Weed management has been a significant challenge for many farmers and retailers in 2018. The challenges range from short planting windows to shorter pre-emergence and post emergence herbicide application windows to early soybean flowering. As we approach the end of growth stage cutoffs for herbicide applications in soybean can we expect any damage from herbicides and especially the Group 14 herbicides? Well unfortunately the answer to that question is the good ole Extension cop-out answer “Well folks that depends“…..
What growth stage was the soybean crop at? Where in the United States are you located? Was the crop stressed before or more importantly after the application? What rate, a.i., adjuvants, carriers, tank mix partner, etc are we dealing with? What soybean variety did you plant? What phase is the moon in….well not really… but you all get the point. Generally speaking as the soybean growth stage approaches R1 (flowering) the risk for yield loss increases. However this is a highly regional response as we have documented differential yield responses from a +1.2% yield gain in the south to a -4.7% to -4.1% yield loss from the I-states north (Table 1). Furthermore as we transition from specifically using lactofen as a “herbicide” to a tool in white mold management we also note a differential response. 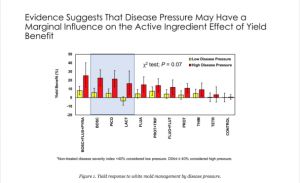 In a recent meta-analysis where Dr. Smith focused on the 6 oz lactofen rate at R1 application he noted a 3.7% yield loss in low-to-moderate disease pressure, but a significant yield increase in high-pressure situations (Figure 1). In Dr. Smith’s meta-anlaysis he does want to emphasize they noticed A LOT of variability among varieties and environments tested as you can see by the error bars around treatments in Figure 1. In summary we would expect some level of yield loss in these late “hot” applications; however in-terms of long-term weed management we would rather see you take a small yield hit than allow herbicide resistant weeds go back to seed and replenish the weed seed bank. This is even more critical with potential Chinese tariffs and tighter phytosanitory regulations centered around weed seeds. J.M. Orlowski, B.J. Haverkamp, R.G. Laurenz, D.A. Marburger, E.W. Wilson, S.N. Casteel, S.P. Conley, S.L. Naeve, E.D. Nafziger, K.L. Roozeboom, W.J. Ross, K.D. Thelen, and C.D. Lee. 2016. 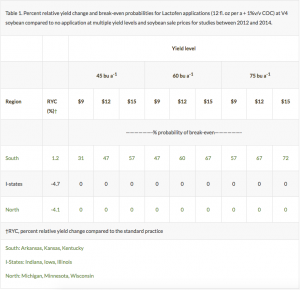 High-input soybean management systems affect soybean yield, yield components, and economic break-even probabilities. Crop Sci. 56: 4: 1988-2004. doi:10.2135/cropsci2015.10.0620.